This place was recorded c.1000 as Stybbanhythe (Stybba’s haven or landing place) and it was the only east London district to be entered in Domesday Book (as Stibenhede), when the principal landowner was the bishop of London. The parish church of St Dunstan and All Saints is said to have been founded by the nose-tweaking St Dunstan himself and it possesses a pre-Conquest stone carving of the Crucifixion. 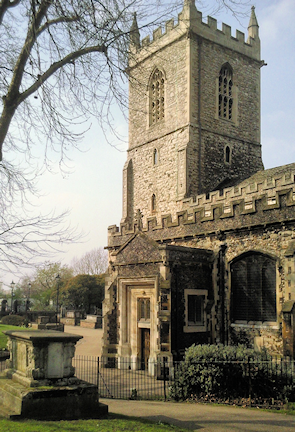 Though the church has been rebuilt, remod­elled, reordered and restored, it retains signi­ficant medieval features, including its 15th-century tower (shown in the photo­graph on the right). By the 16th century, the episcopal manor of Stepney covered almost all of what became known as the East End. Following the growth of the Tudor navy and the mercantile marine, Stepney became a popular place of residence for seamen and retired naval officers. From the late 17th century, and especially in the early 18th, specu­lative developers built small groups of houses here, which included some short rows of terraced houses, a ground­breaking innov­ation at that time. In the 18th century most London-registered ships sailed from docks in the parish of Stepney, which then took in much of east London’s riverside. Over the course of the 19th century Stepney’s character was trans­formed as London expanded to absorb it. Commercial Road lived up to its name by filling with shops and other businesses. Towards the end of the century Jewish immig­rants poured into Stepney and numerous small synagogues opened, together with dedicated insti­tu­tions for the new community, such as schools and a hospital. In the siege of Sidney Street – also known as the Battle of Stepney – in 1911, two Latvian anarchists, wanted for the murders of three policemen in Houndsditch, died in a house fire during an armed assault commanded by Winston Churchill. Slum clearance began in the 1930s and this was combined with the rebuilding of bomb sites after the Second World War. Old neigh­bour­hoods were erased as the borough and county councils erected some of the East End’s most colourless and ungainly estates. Those who could afford to move out did so, including most of the Jewish population, leaving behind them a community of the dispos­sessed. During the 1950s and 1960s Stepney’s criminal minority acquired a reputation as small-time conmen, poor relations of the more notorious gangs in neigh­bouring Whitechapel and Bethnal Green. In the early 1970s council building reached a nadir – in terms of quality – as cheap blocks were crammed into the last few available sites. By the end of the decade conser­va­tionists were fighting to save the terraced houses that survived from the late 17th to early 19th centuries and these have since been rehab­il­itated. 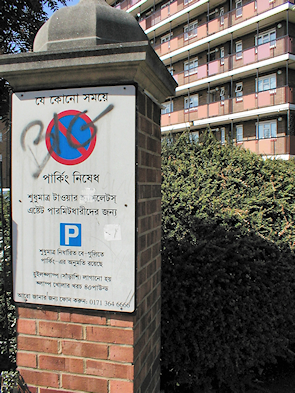 From the 1980s immig­rants from the New Commonwealth became the principal ethnic groups here, especially those from the Sylhet district of Bangladesh. The actor Terence Stamp and the playwright Arnold Wesker were both born in Stepney in the 1930s. * The picture of St Dunstan’s Church, Stepney on this page is adapted from an original photograph, copyright Marathon, at Geograph Britain and Ireland, made available under the Attribution-ShareAlike 2.0 Generic Licence. Any subsequent reuse is hereby freely permitted under the terms of that licence.